fill my heart with each reading, teaching something new every time. Since I read several at once, I saw an opportunity to share some of my reflections. 120:1~ I call and He answers. This promise is expressed throughout the psalms, throughout the Bible, I’ve written about it many times before, even so, I remain humbly awed that the Creator answers my calls. God doesn’t have call waiting or voice mail. He takes every single call, even when I’m repeating myself. about anything, because God takes care of everything. These reminders are as much for my benefit as theirs. I am grateful for a Night Watchman that cannot sleep. The chapter ends by saying, “The Lord will keep you from every kind of harm. He will watch over your life. The Lord will watch over your life no matter where you go, both now and forever.”(vs. 7-8). With all of our comings and goings during this transitional time, this promise brings great comfort, peace, and joy to my heart. 124 ~ Sometimes when reading the psalms, I get very distracted because I start singing a song inspired by that psalm. This is one of those psalms. to those who are good. Do good to those whose hearts are honest. But the Lord will drive out those who have taken crooked paths. He will drive them out with those who do evil things.” (vs4-5). We often see the wicked prosperous in this life and forget that ultimately God’s judgment will prevail. Everyone will face the actions and misdeeds of this life. The question will be whether or not they accepted God’s salvation and followed His commands, to the best of human capability. Yes, we will stumble. Thankfully, God is merciful and gracious. He’s given us the free gift of salvation if only we follow His way to accept it. 126 ~ The Lord does so much for us we ought to be the most joyful people on the planet. Then I came to verses 5-6. I couldn’t help but think of the friend I mentioned at the end of this post. She’s been through so much loss. 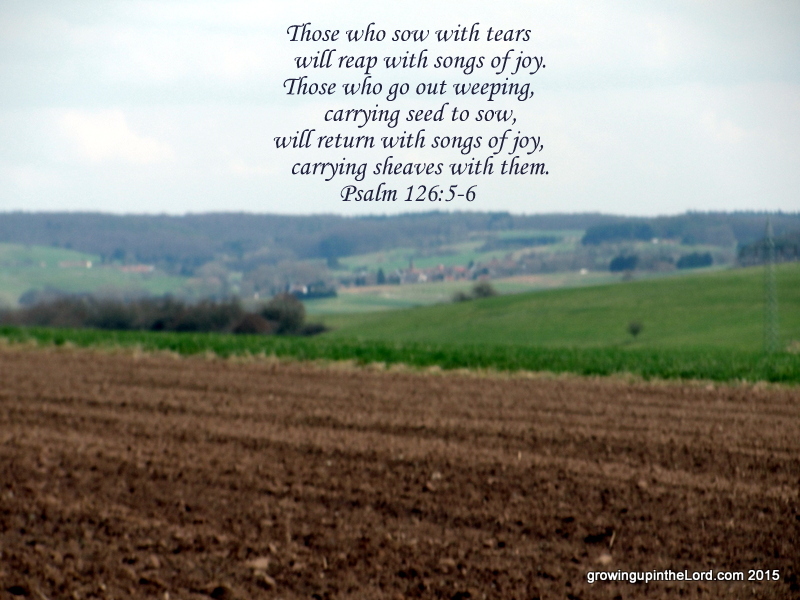 An image of her sowing seeds of grief in this season, reaping joy in the next, and carrying armloads of joy beyond imagination filled my mind and heart. I pray that she reaps an overwhelming harvest of joy soon. I pray for patience, as God’s timing is always perfect and our tunnel vision is nothing compared to His IMAX screen. 127 ~ The last psalm in my catching up reflected many of the same ideas as psalm 121, with an extra message that seemed just for me. “If the Lord doesn’t build a house, the work of the builders is useless.” (vs.1). As we prepare to be in a house of our own with our own stuff for the first time in almost seven months, I am excited! However, we must remember to keep God in the center of our family. I don't know how I missed this blog! I really thought I knew most of the women who were blogging from our fellowship. I'd love to have you email me. maidservantsofchrist@gmail.com.